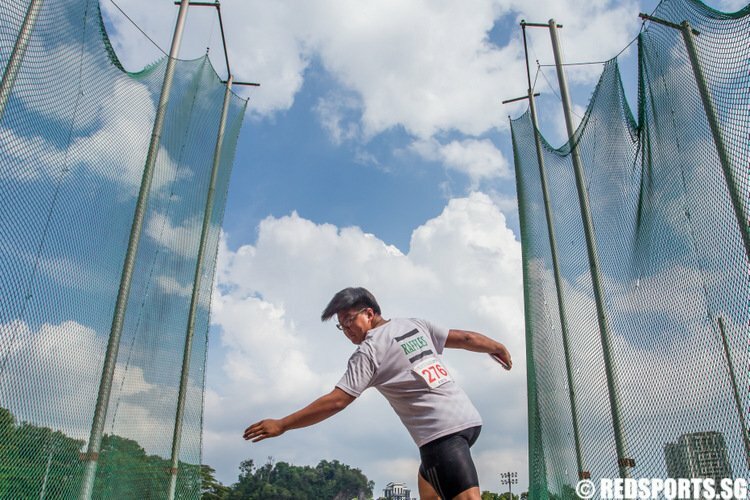 Jalan Besar Stadium, Monday, May 26, 2014 — Despite being reduced to 10 men in the second half, Meridian Junior College (MJC) managed to preserve their 1–0 lead against Saint Andrew’s Junior College (SAJC) to reclaim their National A Division Football Championship title. Mohamed Faizal (#10) scored the winning goal for MJC to ensure a fourth title in five years. MJC have won the title six times since the school was founded in 2003. 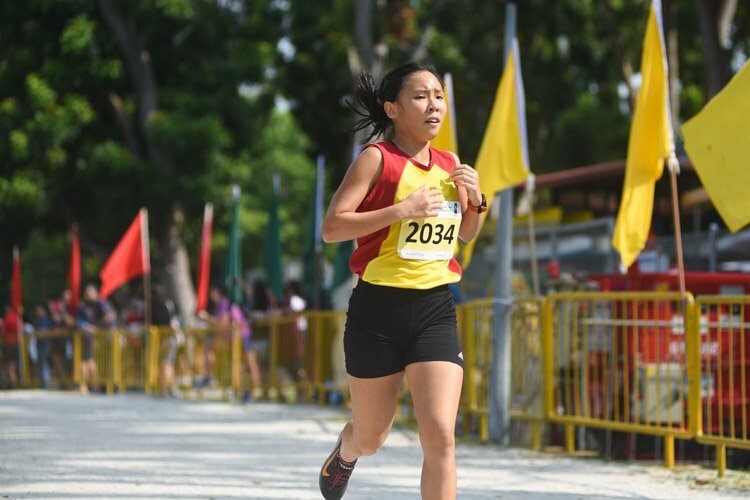 On the other hand, SAJC have appeared in three finals over the last five years. MJC missed out on the final last year after going down to Victoria Junior College in the semi-final and finished in third position eventually. Muhammad Faiz (MJC #5) was booked early into the game following a sliding tackle on his opponent. SAJC then took a free-kick but nothing came of it. 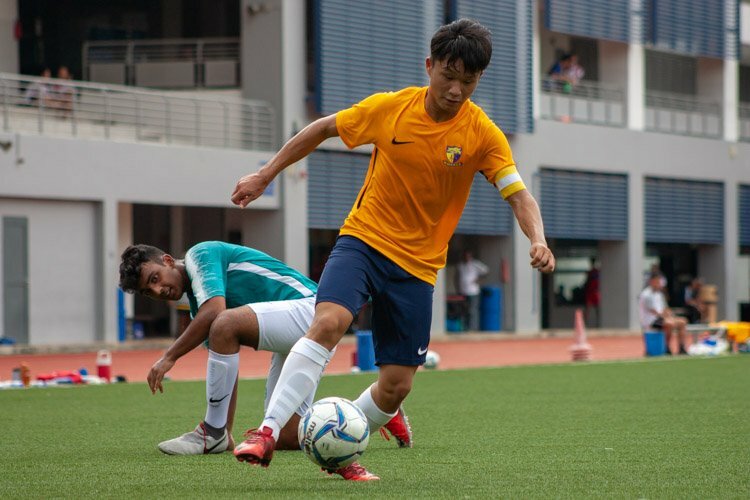 As MJC were putting up an aggressive defensive effort to stop their opponents’ plays, SAJC were awarded a number of free-kicks but their attempts were easily cleared. MJC’s Haziq Syamil (#3) and Joel Chan (#18) registered several clearances in the first half to deny SAJC. 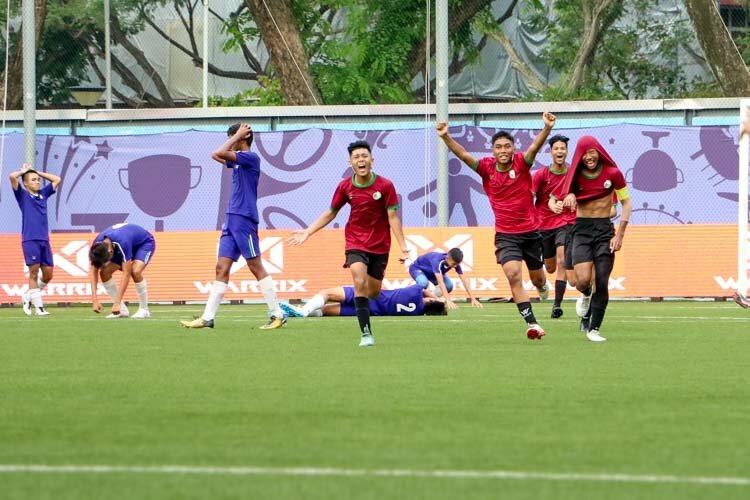 Having connected with Navin Farhan Mohan’s (MJC #6) pass, Haziq (MJC #3) drilled an unstoppable attempt beyond SAJC goalkeeper Wong Li Jie (#13) into the net, but the MJC celebrations were short-lived as it was ruled offside. Syabil Anwar (MJC #7) then found Haziq (MJC #3) in the box, but SAJC cleared just before Haziq made it to the ball. MJC were making a positive start to the game by dictating play but efforts on goal were hard to come by. This was especially so for Haziq (MJC #3), who displayed his aerial prowess several times during the first half, looking to nod the ball into the net but was unable to convert. Leonard Tay (SAJC #25) was given SAJC side’s first yellow card of the game following a foul on Abdul Mateen (MJC #4). Leonard (SAJC #25) was in a dangerous spot just by the post, but failed to make the desired connection with Lim Wei Jie’s (SAJC #2) pass as Faiz (MJC #5) cleared the ball just in time. 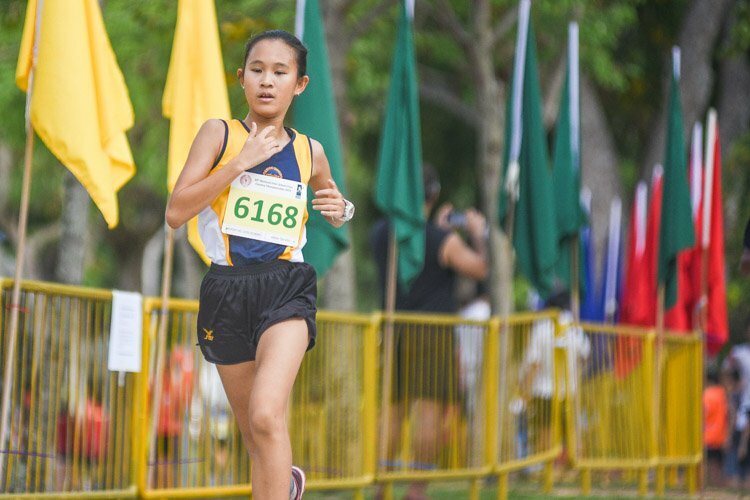 SAJC had good runs during the game, but were unable to finish off. In the 22nd minute, Abdul Mateen (MJC #4) made an incisive long pass to Haziq (MJC #3) from the halfway line. 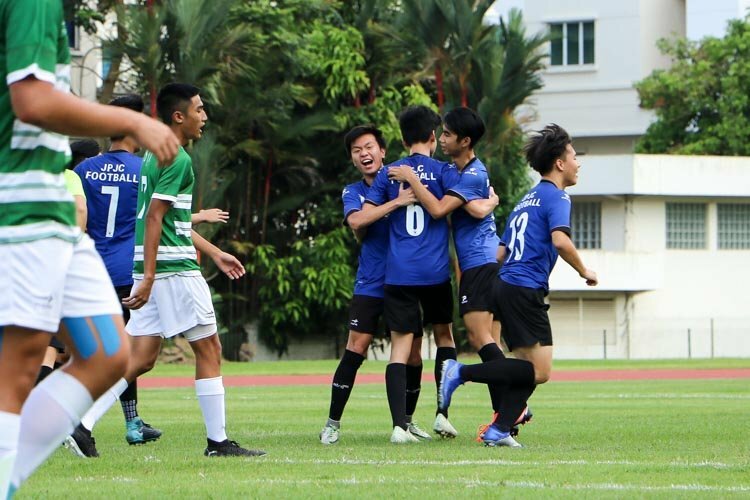 Haziq’s hopeful header was then met by Mohamed Faizal (MJC #10) who volleyed the ball over Li Jie (SAJC #13) in goal into the net to give MJC a deserved 1–0 lead. David Chew (SAJC #2) was shown a yellow card after a foul on Joel (MJC #18). Michael Paul Hendrick (MJC #8) took the free-kick at the halfway line, launching the ball right in front of SAJC’s post. This caused a commotion in the box but SAJC managed to clear the ball away. Haziq (MJC #3) then threatened SAJC’s defence again with a header, causing SAJC goalkeeper Li Jie (#13) to parry it away in a rush, resulting in a loose ball. It was a good scoring opportunity, but there was no one in the box to convert and SAJC managed a clearance before MJC took it. Faizal (MJC #10) set up Syabil Anwar (MJC #7) for a shot, but his attempt was fumbled away by SAJC goalkeeper Li Jie (#13). Syabil then found the loose ball again right in front of the net to try for a goal, but Li Jie tipped his shot over the bar. Joshua Tan (SAJC #22) looked to find a well-placed Marcus Teng (SAJC #10) from the midfield, but MJC goalkeeper Dagan Lim (MJC #25) swiftly reacted and rushed out to prevent Marcus’ strike. An MJC defender followed up with a clearance. Navin (MJC #6) then went on a good run but goalkeeper Li Jie (SAJC #13) hurried out to collect the ball for the last action of the half. In the second half, Haziq (MJC #3) connected on Michael’s (MJC #8) free-kick to nod the ball just inches short of the line, but goalkeeper Li Jie (#13) palmed the ball away before it trickled over. 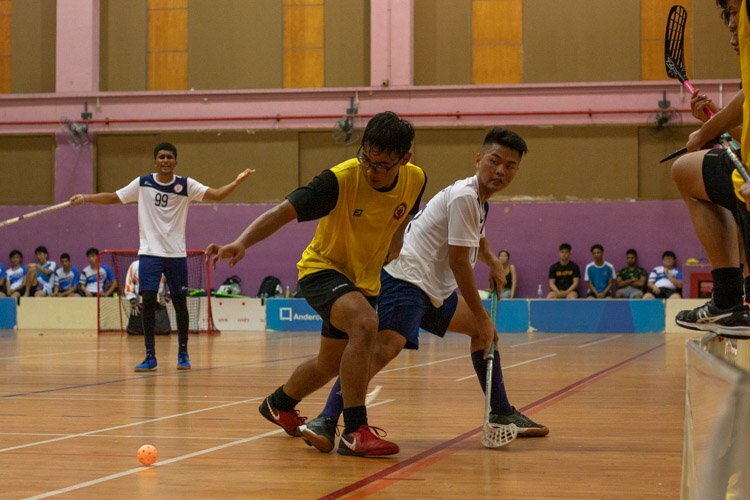 Following a tussle over a loose ball, Navin (MJC #6) looked to drill it into the net, but Li Jie (SAJC #13) managed another heroic save with his legs. 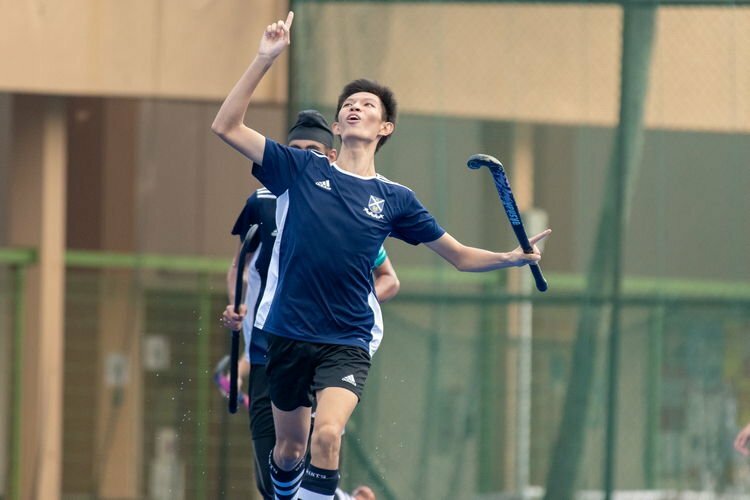 Li Jie’s series of saves were denying MJC a second goal and giving SAJC hopes of a comeback. 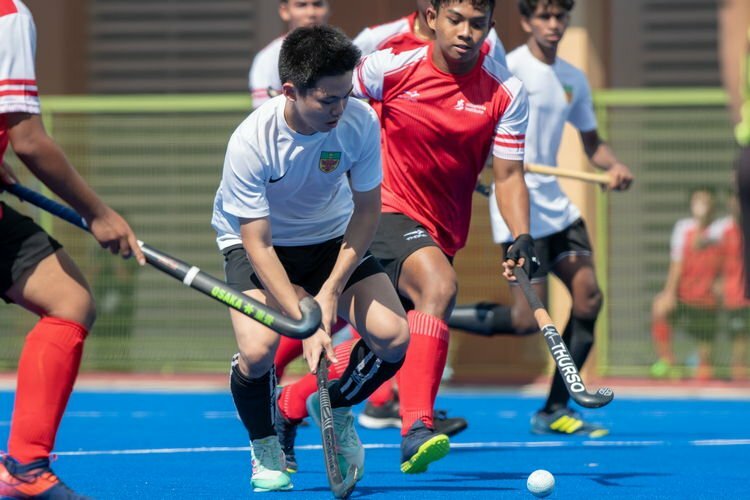 The momentum of the match when Faiz (MJC #5) was sent off in the opening minutes of the second half after picking up his second yellow card of the game, leaving MJC with 10 men on the pitch. SAJC then had a clear scoring opportunity in the box, as MJC goalkeeper Dagan (#25) was out of sight following an earlier save. Marcus (SAJC #10) launched a shot at goal but was unlucky as the ball rattled off the crossbar. Thereafter, SAJC were awarded a free-kick and Marcus (SAJC #10) whipped it into the crowded box, but no one connected, allowing Dagan (MJC #25) to collect comfortably. Despite having an advantage with an extra player on the pitch, SAJC were unable to edge past MJC’s alert and well-coordinated defence. MJC restricted their opponents to few opportunities, with Joel (#18) and Soon Wei Jun (#15) constantly denying SAJC. Syahidul Matin (MJC #12), who came into the second half as a substitute, also made good defensive efforts on his end. MJC then had a chance to put the game away for good when Lucas Lee (MJC #24) had a one-on-one opportunity right in front of goal after a good pass from Faizal, but he drove his shot over the bar. 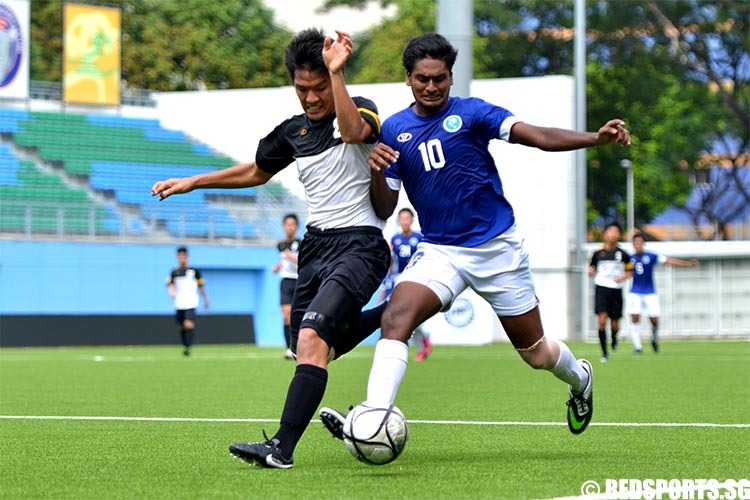 Towards the end of the game, MJC opted to introduce Muhammad Bin Imran (MJC #16) to the action. 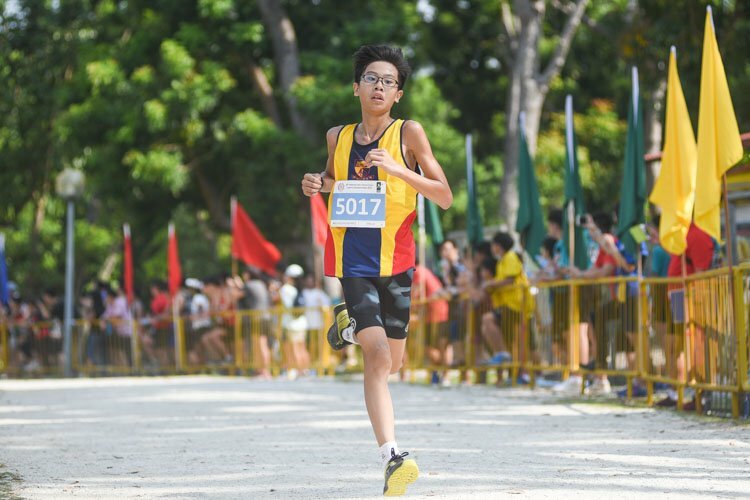 He made a stunning impact from the moment he came into the game, as he went on good runs to threaten SAJC’s defence. 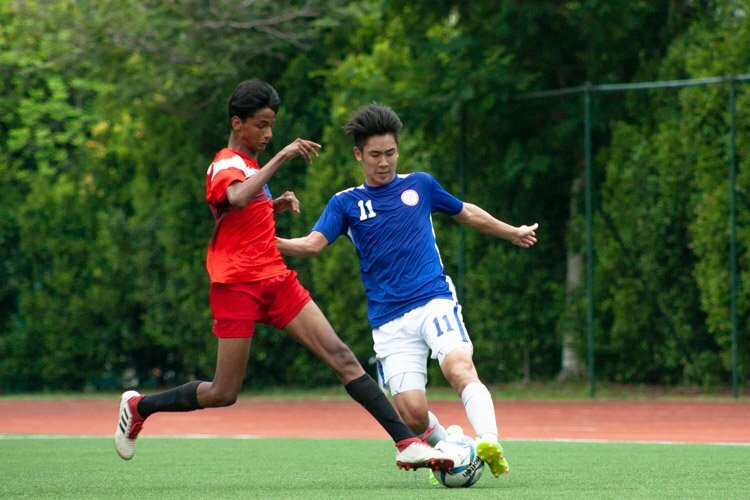 Faizal’s (MJC #10) first-half goal proved to be the difference, as MJC reclaimed the title with a 1–0 win over SAJC.